I HAVE made many books about well-behaved people. Now, for a change, I am going to make a story about two disagreeable people, called Tommy Brock and Mr. Tod. Nobody could call Mr. Tod "nice." The rabbits could not bear him; they could smell him half a mile off. He was of a wandering habit and he had foxey whiskers; they never knew where he would be next. His clothes were very dirty; and as he slept in the day-time, he always went to bed in his boots. And the bed which he went to bed in, was generally Mr. Tod's. He sat in the sun, and conversed cordially with Tommy Brock, who was passing through the wood with a sack and a little spud which he used for digging, and some mole traps. 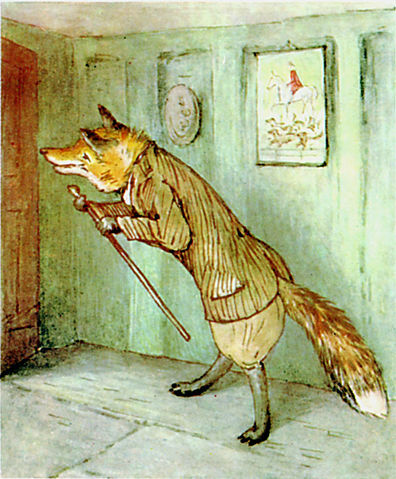 He complained bitterly about the scarcity of pheasants' eggs, and accused Mr. Tod of poaching them. And the otters had cleared off all the frogs while he was asleep in winter—"I have not had a good square meal for a fortnight, I am living on pig-nuts. I shall have to turn vegetarian and eat my own tail!" said Tommy Brock. So old Mr. Bouncer laughed; and pressed Tommy Brock to come inside, to taste a slice of seed-cake and "a glass of my daughter Flopsy's cowslip wine." Tommy Brock squeezed himself into the rabbit hole with alacrity. And Mr. Bouncer laughed and coughed, and shut his eyes because of the cabbage smoke . . . . . . . . . .
Benjamin climbed over the wall, into a meadow. He found another mole trap newly set; he was still upon the track of Tommy Brock. It was getting late in the afternoon. Other rabbits were coming out to enjoy the evening air. One of them in a blue coat by himself, was busily hunting for dandelions.—"Cousin Peter! Peter Rabbit, Peter Rabbit!" shouted Benjamin Bunny. "Whatever is the matter, Cousin Benjamin? Is it a cat? or John Stoat Ferret?" "No, no, no! He's bagged my family—Tommy Brock—in a sack —have you seen him?" "Tommy Brock? how many, Cousin Benjamin?" "Seven, Cousin Peter, and all of them twins! Did he come this way? Please tell me quick!" "Yes, yes; not ten minutes since . . . . he said they were caterpillars; I did think they were kicking rather hard, for caterpillars." "He had a sack with something 'live in it; I watched him set a mole trap. Let me use my mind, Cousin Benjamin; tell me from the beginning." Benjamin did so. "My Uncle Bouncer has displayed a lamentable want of discretion for his years;" said Peter reflectively, "but there are two hopeful circumstances. Your family is alive and kicking; and Tommy Brock has had refreshment. He will probably go to sleep, and keep them for breakfast." "Which way?" "Cousin Benjamin, compose yourself. I know very well which way. Because Mr. Tod was at home in the stick-house he has gone to Mr. Tod's other house, at the top of Bull Banks. I partly know, because he offered to leave any message at Sister Cottontail's; he said he would be passing." (Cottontail had married a black rabbit, and gone to live on the hill). They climbed up and up;—"He was at home; I saw his black ears peeping out of the hole." "They live too near the rocks to quarrel with their neighbours. Come on Cousin Benjamin!" This house was something between a cave, a prison, and a tumble- down pig-stye. There was a strong door, which was shut and locked. At the other end of the table was a partly unfolded tablecloth, a plate, a tumbler, a knife and fork, salt- cellar, mustard and a chair—in short, preparations for one person's supper. The room inside was so dark, that at first they could make out nothing; but they could hear a noise —a slow deep regular snoring grunt. And as their eyes became accustomed to the darkness, they perceived that somebody was asleep on Mr. Tod's bed, curled up under the blanket.—"He has gone to bed in his boots," whispered Peter. The sun had set; an owl began to hoot in the wood. There were many unpleasant things lying about, that had much better have been buried; rabbit bones and skulls, and chickens' legs and other horrors. It was a shocking place, and very dark. The light showed a little door in a wall beside the kitchen fireplace— a little iron door belonging to a brick oven, of that old-fashioned sort that used to be heated with faggots of wood. And presently at the same moment Peter and Benjamin noticed that whenever they shook the window— the little door opposite shook in answer. The young family were alive; shut up in the oven! They dug and dug for hours. They could not tunnel straight on account of stones; but by the end of the night they were under the kitchen floor. Benjamin was on his back, scratching upwards. Peter's claws were worn down; he was outside the tunnel, shuffling sand away. He called out that it was morning—sunrise; and that the jays were making a noise down below in the woods. As usual, when out of humour, he determined to move house. First he tried the pollard willow, but it was damp; and the otters had left a dead fish near it. Mr. Tod likes nobody's leavings but his own. Mr. Tod slapped his stick upon the earth and fumed; he guessed where Tommy Brock had gone to. He was further annoyed by the jay bird which followed him persistently. It flew from tree to tree and scolded, warning every rabbit within hearing that either a cat or a fox was coming up the plantation. Once when it flew screaming over his head— Mr. Tod snapped at it, and barked. The sight that met Mr. Tod's eyes in Mr. Tod's kitchen made Mr. Tod furious. There was Mr. Tod's chair, and Mr. Tod's pie dish, and his knife and fork and mustard and salt cellar and his table-cloth that he had left folded up in the dresser—all set out for supper (or breakfast)—without doubt for that odious Tommy Brock. But what absorbed Mr. Tod's attention was a noise—a deep slow regular snoring grunting noise, coming from his own bed. For the next twenty minutes Mr. Tod kept creeping cautiously into the house, and retreating hurriedly out again. By degrees he ventured further in—right into the bedroom. When he was outside the house, he scratched up the earth with fury. But when he was inside—he did not like the look of Tommy Brock's teeth. Mr. Tod's proceedings were peculiar, and rather uneasy, (because the bed was between the window and the door of the bedroom). He opened the window a little way, and pushed out the greater part of the clothes line on to the window sill. The rest of the line, with a hook at the end, remained in his hand. At last Mr. Tod's preparations were complete. The pail was full of water; the rope was tightly strained over the top of the bed, and across the window sill to the tree outside. The moment he had gone, Tommy Brock got up in a hurry; he rolled Mr. Tod's dressing-gown into a bundle, put it into the bed beneath the pail of water instead of himself, and left the room also—grinning immensely. "I will wash the tablecloth and spread it on the grass in the sun to bleach. And the blanket must be hung up in the wind; and the bed must be thoroughly disinfected, and aired with a warming-pan; and warmed with a hot-water bottle." He hurried round the house to get a shovel from the kitchen— "First I will arrange the hole— then I will drag out that person in the blanket . . ."
Tommy Brock was sitting at Mr. Tod's kitchen table, pouring out tea from Mr. Tod's tea-pot into Mr. Tod's tea-cup. He was quite dry himself and grinning; and he threw the cup of scalding tea all over Mr. Tod. "Now for it! Run in, Cousin Benjamin! Run in and get them while I watch at the door." Still Benjamin hesitated, and Peter kept pushing him— "Be quick, it's all right. Shut the oven door, Cousin Benjamin, so that he won't miss them." "I've got them! Can we get away? Shall we hide, Cousin Peter?" Peter pricked his ears; distant sounds of fighting still echoed in the wood. Great was old Mr. Bouncer's relief and Flopsy's joy when Peter and Benjamin arrived in triumph with the young family. The rabbit- babies were rather tumbled and very hungry; they were fed and put to bed. They soon recovered. 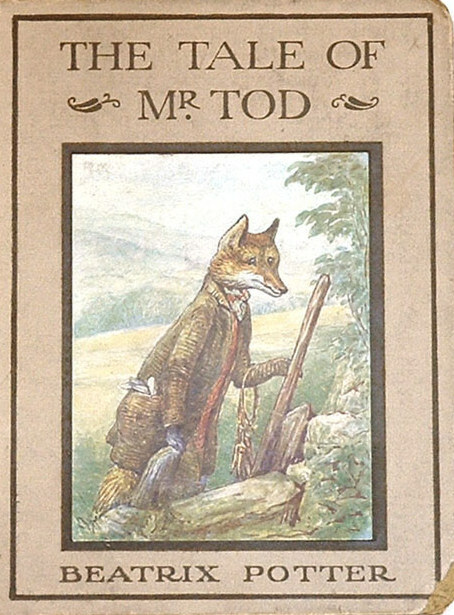 Add The Tale of Mr. Tod to your own personal library.